We know that there's nothing more frustrating than creating a beautiful email signature with our software, only to experience issues when it comes to installing it, no matter how big or small the hurdle may be. Whilst we do try and make the installation process as simple as possible for each and every email client, wouldn't it just be great if your signature could be installed for you? Well now it can! We've been working hard on our signature installer app over the past few months so that all you need to do is insert your signature key and let our app do the rest for you. What's even better is that not only will it install your email signature for you, it will even automatically update your signature whenever you make changes to it from your Email Signature Rescue dashboard. Firstly, download our signature installer app for Mac OS X. Once downloaded, run it and select your email client and mail account, then insert your signature key. Our app will then use the signature key to pull in your email signature and install it in your selected email client for you. Whenever the installer app detects a change to the signature from your ESR dashboard, it will automatically push an update to your e-mail client meaning you'll never have to re-install your signature again. Which email clients are supported? 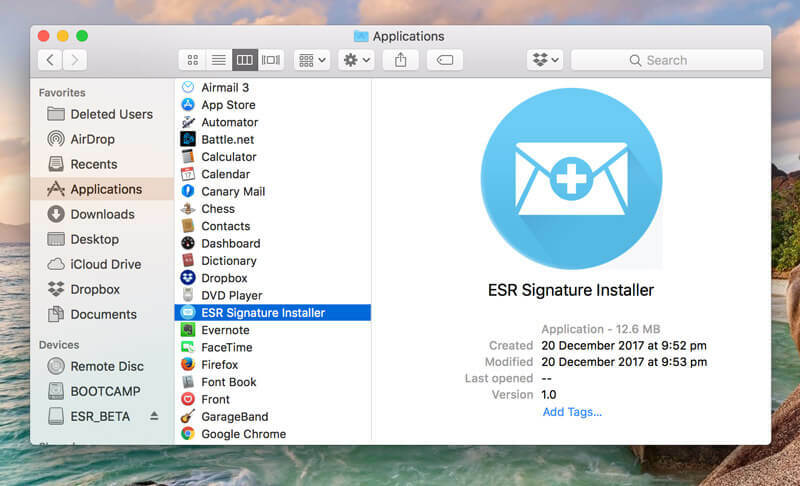 Download the ESR Signature Installer App for macOS. Once downloaded, double click the .zip to extract the setup file. Run the extracted ESR BETA Setup.dmg file. 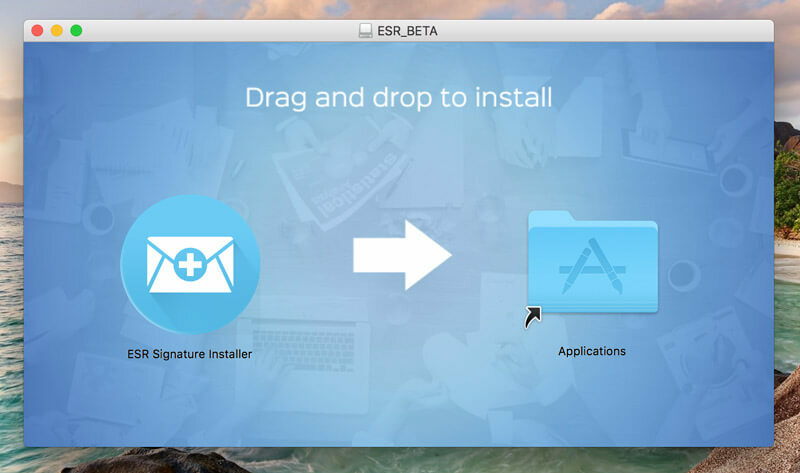 Drag the ESR Signature Installer icon to the Applications folder to install. Open Launchpad or your Applications folder in Finder and run the ESR Signature Installer. 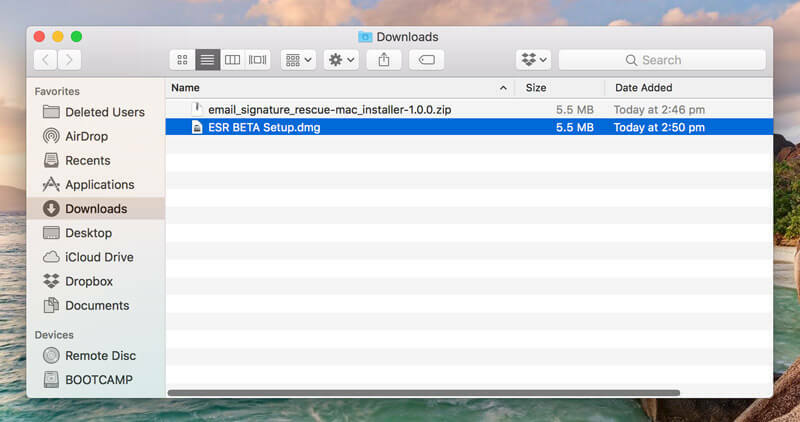 NOTE: You may receive a message saying "ESR Signature Installer" is an application downloaded from the internet. Are you sure you want to open it? Click the Open button. NOTE: You may receive a message saying "ESR Signature Installer" would like to control this computer using accessibility features. Open your System Preferences and allow the ESR Signature Installer permissions as required. Please refer to the troubleshooting guide below for detailed instructions. Once the required permissions have been allowed, your signature installer app will be running and is ready to install your email signatures. Open the ESR Signature Installer. Click the Add New Email Signature button. Enter a name for your email signature at the top left of your signature box. Select your email client from the drop-down box. Select the email account you want your signature to work with. Paste your signature key and click Save Key. Your signature will now be installed and automatically updated whenever changes are made. 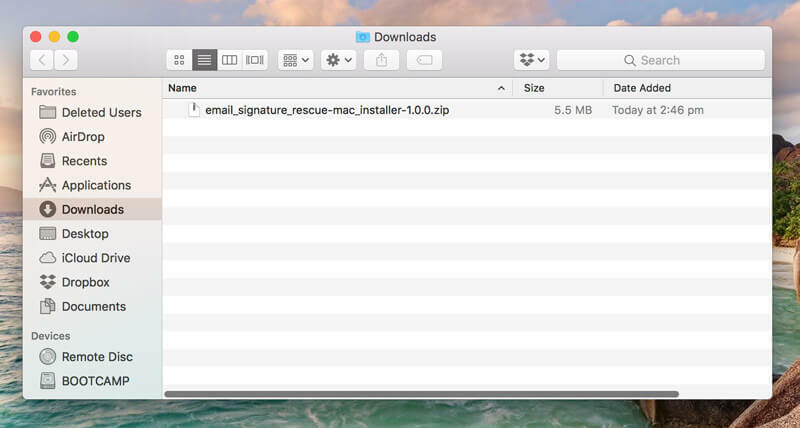 Open the Email Signature Rescue Installer App from Finder in MacOS. The app must be open for the changes to be applied. The app will prompt you to close your email client software if it is open. This is necessary to change the signature. You can tick to re-open the software after the changes in this prompt. When your email client is reopened, the changes made in your ESR Dashboard have been applied to the signature. If your email signature isn't inserting when composing a new email, there's two things you should check. Make sure your email signature is installed by going to your email client's settings or preferences. If your email signature is not installed then you should make sure everything in the app is correct. If it is and the app isn't installing your signature, please get in touch with our friendly Support Team by clicking help button from your Email Signature Rescue account. If your email signature IS installed, but isn't inserting into your emails, you'll need to set it as your default email signature for the account which can be done from your email client's settings or preferences. If none of the above helped you resolve the issue you're experiencing, please get in touch with our friendly Support Team by clicking help button from your Email Signature Rescue account. If your email signature is inserting into another webmail account you have which it shouldn't be then you should double check that you've selected the correct email client within the installer app. I have multiple businesses and want to use different email signatures, how can I do this? Many of our users are running multiple businesses and need to have different signatures for each of their email accounts but aren't sure how to do this. Don't worry though, it's simple. When using the signature installer app, simply install a signature, then if you require another one, click the Add New Signature button below and follow the same process as you did with your first signature. Your email signature will only automatically update if you're using your signature key. If you have inserted the HTML via advanced settings then your signature will not automatically update and will require a re-install each time you make changes. If you have your signature key inserted, you should check that the key is correct and current with your email signature in your account. Go to your dashboard and ensure the key matches the one installed. If it does, go to the installer app and click Preview Signature, if the signature has updated then it's working correctly and the issue is elsewhere. If it doesn't update then you should get a new key for your signature and insert the new key. Can I use your installer app if I'm not an Email Signature Rescue member? Copy your email signature's HTML code. Open the installer app, create a signature and select Advanced Settings. Paste your email signature HTML code. Of course if you're not a member then your email signature won't automatically update whne you make changes, but if you choose to become a member then you will be able to do this and make your life much simpler. If you're interested in our software you may like to sign up here and try it out. We offer a 7-day money back guarantee on all plans but we're sure you'll love it! In order for the app to run correctly, it requires permissions to make changes on your device. These changes aren't harmful in any way, but are required in order to open certain email clients and install your signature for you. You may encounter a pop-up box that says "ESR Signature Installer" would like to control this computer using accessibility features. This is completely normal and you can allow this with the following instructions. Make sure you're on the privacy tab. At the bottom left of System Preferences you'll see a Padlock. Click this and enter your password. Now that it's unlocked, you want to tick the box next to ESR Signature Installer in order to give it the permissions required. Click the Padlock at the bottom left again to re-lock it. It's possible that you may encounter a message when attempting to run the app which warns you about opening the app as it's from an unidentified developer. This is completely normal but you need to allow the app to run before you will be able to use it. Select the General tab, then at the bottom you should see a button which says Allow ESR Signature Installer. Click this and follow the prompts to allow it to run.